As a member of Crafty's Angels, our team leader, the lovely Linda Parker of Papercraft with Crafty sets us a challenge whereby we have to create a project using any three elements from the above grid as long as they are in a straight line (i.e. vertical, horizontal or diagonal). I decided to go straight down the middle as I wanted to showcase some of the new limited-time products from the Snowflake Showcase which are due to be released on 1st November and will only be available until 30th November 2018 while supplies last. Please see below for more details. To make this card, I used a piece of thick Whisper White cardstock (140490) measuring 10" x 7" and scored down the centre at 5" to make a 7"x5" card base. 1st layer - Silver Foil (132178) measuring 6¼" x 4¼". 2nd layer - Whisper White regular cardstock (106549) measuring 6" x 4" which I ran through the Big Shot using the 'Softly Falling' embossing folder (139672). I took a strip of Vellum cardstock (106584) slightly wider than my card and wiped over it with an embossing buddy (103083) to get rid of any static. Using Versamark Ink (102283) I stamped the sentiment from the new 'Snow Is Glistening' stamp set , added some silver Stampin' Emboss Powder (109131) and heat set it using Stampin' Up's Heat Tool (129054). I then wrapped this around my second layer and secured it at the back with some adhesive tape; I then added this layer to the silver foil. 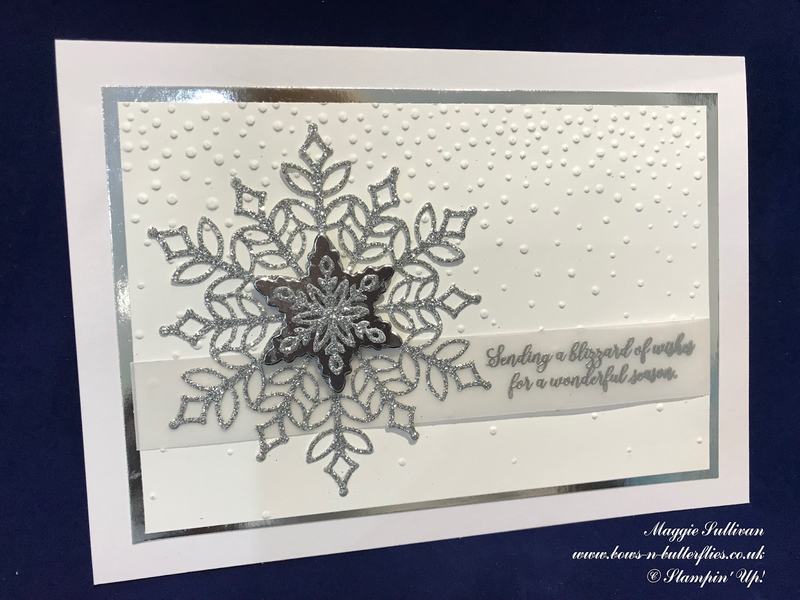 Finally, I cut the snowflakes from the new 'Snowfall Thinlets' dies using silver glimmer paper (146960) and silver foil (132178) and layered onto the card with liquid glue. I have to say that I am impressed with this set of dies as there are 20 in total with a large selection of different size snowflakes which can be used for a variety of projects. To see what some of the other team members made, please click on the links below.